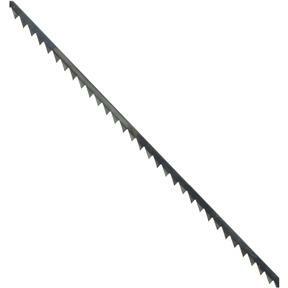 .118" 10 TPI Scroll Saw Blades, Pinned End, 6 pk. Grizzly T28365 - .118" 10 TPI Scroll Saw Blades, Pinned End, 6 pk. SuperCut Pinned End Scroll Saw Blades are the best quality, hard tooth blades designed for saws that require 5 inch (pin to pin) blades. Always have another one of the right blade on hand with this six pack of .118" wide, 0.020" thick 10 TPI blades. The best way to determine which size blade to use is by trying different size blades. Each individual person has a different technique and feel for the work; therefore, each person will prefer the size and type blade that works the best for that special person. The rule of thumb is to select a smaller blade with more teeth for cutting thin material and small radius, and larger blades with less teeth for thicker materials and larger radius.